We are a unique name in the market to provide our respected customers an exclusive range of Aluminium Eyeball Diffuser. 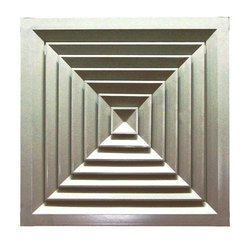 We are a leading manufacturer of a range of supply Air Diffusers and return air floor grills. The air diffusers have minimum resistance to the air flow and include larger target area of the production department, ensuring even distribution of air. Catering to the requirements of our clients, we are involved in offering Rectangular Ceiling Diffuser. 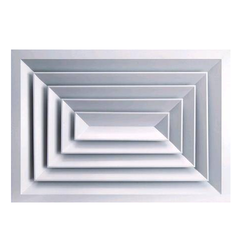 - Square ceiling grid diffuser used for supply and return air with multi aperture core. - Manufactured from extruded and stamped aluminium, powder painted white. - Removable core for neck mounting into the duct. - Available sizes: Neck size of 150 150 mm to 450 450 mm with face size of 595 595 for 600 600 mm T-Bar panel. Multcone Ceiling Square Diffusers - FullyExtruded Alum. Constructon with Removable cores.Neck size and out to out size (nominal)e150 x 150 mm / 295x295 mm225 x 225 mm / 370 x 370 mm300 x 300 mm / 445 x 445 mm375 x 375 mm / 520 x 520 mm450 x 450 mm / 595 x 595 mm. High capacity louvered face directional diffusers designed to supply large volumes of air at relatively low sound level and pressure drops. Available in square, rectangular and round shapes, with anti-smudge frame and removable inner core to facilitate adjustment of air control damper. We are one of the established companies involved in manufacturing and supplying wide range of finest quality Square Diffuser.